I shall give you a pair of socks now. Nobody cares. Stop this mindless drivel. Thanks guys, this means a lot to me! I'm looking forward to birthday festivities, and I'm enjoying my early birthday present of a Prizm. Qazz42, does not mean I'm a free house-elf now? Edit: Shaun just called me to wish me a happy birthday and sing me Happy Birthday! Woooooo. I just Facebooked you some happy b-day greetings. 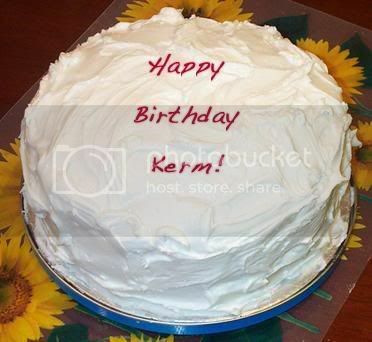 I forgot to bring a cake, but happy birthday Kerm. Thanks for everything you do. Here lies Kermy, a Free Elf. Enjoy your lie-flavored cake, Kerm. Yo yo Kerm, I hear it's your b-day! Let all of us gather 'round, give a big hooray! 20-something years of your mad code skills! I know a certain engineer ain't havin' trouble payin' the bills! Working towards the esteemed ol' PhD! Kerm ain't gonna have any time to be free! But just know this sacrifice ain't bein' in vain! He's gonna rev'lut'nize the world, that's the truth vanilla plain! Let me get down to my point, right real fast! The point of this rap is a point that will forever last! We appreciate all you do, that's not a lie! Thanks for your hard work, our respect towards you is high! But another one's coming right round the bend! In another 365, I'll be back here once more! Rapping again on the Cemetech floor! You don't remember that cake? I remember the cake, I just forgot to deliver it. Hence why I'm thanking you. If you wanted to get creative, you could bake a cake in the shape of a TI-84+SE. You could even use small food-dye-iced brownies for the buttons. @TsukasaZX: Your straight-faced smiley threw me off. Happy birthday Kerm, now that it is more likely to be your birthday in your current timezone. Hope you have a good one - any plans for the day? Double-wishing Kerm a happy birthday through two websites! Lay back, chillax, and enjoy. BenRyves, going out to eat with family, hoping to also take in a Broadway show. Should be fun! comicIDIOT and Keith, wooo, thanks for the awesome cake! I will enjoy its sweet lie icing. Keith, that was a sick rap, I very much enjoyed it and its sentiments. DShiznit, Basicman, Lionel, thank you guys so much. Elfprince, thanks to you, Shaun, and Courtney for doing your best to keep me from getting to sleep. © Copyright 2000-2019 Cemetech & Christopher Mitchell :: Page Execution Time: 0.852642 seconds.